Want to be notified of new releases in dart-lang/dart-pad? The UI client for a web based interactive Dart service. This project is a web based interactive Dart service. It's meant to be a simple, easy way for users to play with Dart on-line, in a zero-install, zero configuration environment. It supports an easy snippet sharing service. See also the dart-services repo. How did we build DartPad? 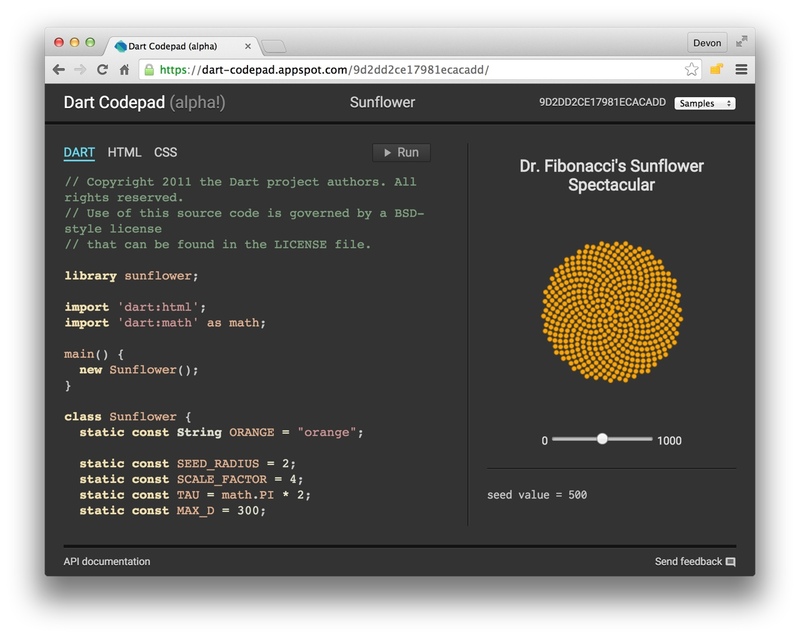 Interested in the tools we used to build DartPad? We put together some documentation about the hosted services - continuous integration, code coverage, cross-browser testing, ... that we used to build DartPad. Each issue in the tracker will be assigned a priority based on the impact to users when the issue appears and the number of users impacted (widespread or rare). Interface bugs interfering with the use of the application in edge cases. Minor user interface warts not significantly impacting functionality, on edge cases only.